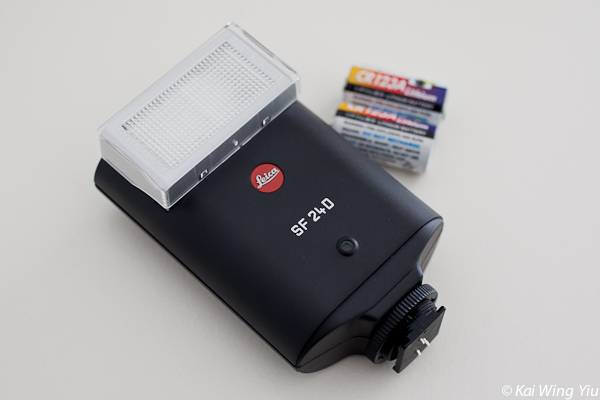 Leica SF 24D (Part No. 14444) is a portable flash (W66 x H109 x D41mm) in the Leica system. Many Leica users say it is not necessary to use flash on a M series camera body. Yes in normal situations, you will never think of using flash. But what if you want to take photographs for a group of people in a room? Do you need to use a flash when the ambient environment is too dark? Or when you want to create a special effect? 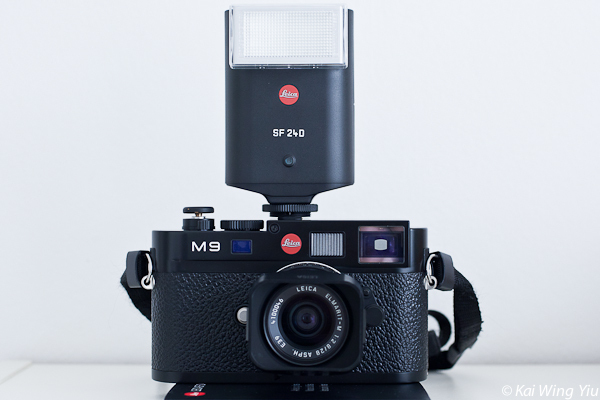 I frequently read about fitting a flashgun on the M9 on the Leica User Forum and finally decided to learn how it works with the M9. What is in the box? Here they are: an instruction manual, two Sanyo CR123A Lithium batteries, wide-angle and telephoto diffusers and the flashgun. On the box it says the flashgun was made in Germany. 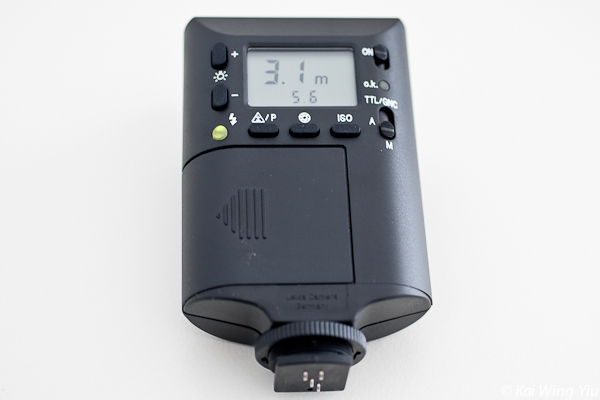 The total weight of the flash is only 180g without batteries. Such a light weight is a result of the power source. The power supply, as you see from the image, is from two CR123A type lithium batteries. This is probably the major drawback because this is not a common type battery, compared with the AA size. I am not sure if you can use rechargeable ones as some users have indicated that this is not possible. Do bring some spare ones if you need to shoot flash frequently. At the beginning I was too hesitant to select this product due to the battery type. In the instruction manual booklet it mentions that the Leica SF 24D is originally designed for the Leica CM or the R8/9 or the M6 TTL/M7. It does not mention anything about the M8 or M9. You may find it odd why Leica does not update their product information after the launch of their latest products. At last in the section of the examples of transmitted data, it says that the SF 24D can also be used with other Leica R and M models. I feel at ease and hopefully this applies to M9. This flashgun has a guide number (GN) of 20/65(in metre/feet) at ISO100. The GN becomes 14/16 and 24/78 with 24mm and 85mm diffuser mounted. This is a capable flashgun for nearly all occasions. In term of capability, one may think of its bigger brother SF 58. I think ergonomically the SF 24D makes the M9 look much better than mounting the flashgun SF 58. The flagship SF 58 has a GN of 58/190 with tilt and swivel function, but it is far too big mounted on the hotshoe of the M9. The SF 58 instead fits much better on the Leica S2. Of course choosing SF58 is nothing wrong as it provides bigger lighting output supplied by the commonly available AA size battery. In other words, you pay more upfront but earn more back by using the cheaper AA batteries in the long run. Yes, everything has a price.